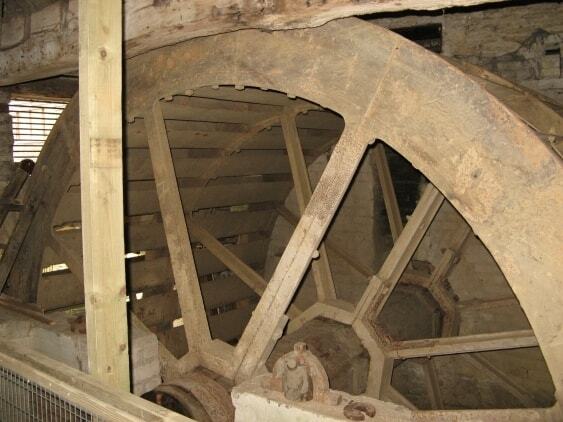 The 13ft (3.96m) diameter 8ft (2.44m) wide water wheel is made of metal and runs on a large diameter wooden shaft. The wheel is of the low breast shot type and it transfers the river flow into useable energy to power the mill machinery. This means that the paddles on its rim were propelled by water running down a concave curved surface called the‘breast’, the curve being concentric with the wheel’s rim. The paddles on this wheel are curved buckets similar to those developed by the French inventor Poncelet who realised that curved paddles were more efficient than flat ones. The water flow, and hence the speed, could be controlled by means of a sluice gate operated either locally or remotely from within the sawmill. When the waterwheel was in use the water was brought to it by a leat from a weir in the Evenlode river some distance upstream. The water wheel turns more slowly than required to run the line shafting so a set of gear wheels is housed between the wheel and the workshop. The largest diameter wheel sits in a pit and its wooden teeth were last replaced in 2004 and are again in need of replacement. When electricity came to the area in the mid 1950s the waterwheel was no longer needed to power the sawmill machinery and in the mid 1970s and, although the tail race still exists, the leat or head race was filled in some years ago to enlarge Combe Yard. Visitors must imagine the river Evenlode running beneath the Mill building. A bypass sluice was used to control the river flow through the water wheel in conjunction with the gate in front of the wheel. The waterwheel is now turned by water delivered by pumps.